Early in his career, in the 1870s, Homer was widely admired for depictions of the Civil War and for idyllic scenes of rural America. The tenor of his work changed decisively, however, during a two-year stay (1881-83) in the English village of Tynemouth on the coast of the North Sea. In both watercolor and oil Homer now focused on the fisherfolk who braved the dangerous sea to earn their spare livelihood. The subject of a robust fisherwoman facing the elements with her baby strapped to her back fits squarely within this theme of man's struggle against natural forces. The present work was first painted in Tynemouth and exhibited in 1883 as The Coming Away of the Gale at the National Academy of Design in New York City. Probably because the original composition incurred unfavorable criticism, Homer kept it for nearly a decade at his studio in Prout's Neck, Maine, before reworking the canvas. 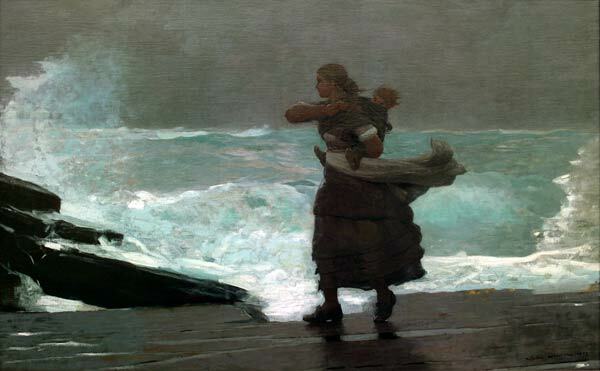 By the time The Gale was shown at the 1893 World's Fair in Chicago, receiving high acclaim, Homer's reputation as one of America's foremost artists was secure.